Lorraine Paton: A book cover!! I have a book cover!! Yay!! My debut book, Devin's Second Chance, will be published in June - YAY! - and, today I'm sharing my very first book cover! 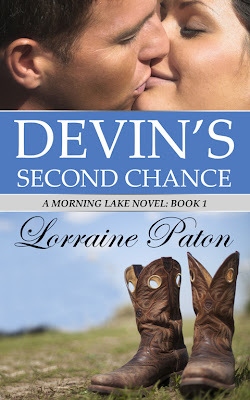 You can sign up for my newsletter (top right side of this page) to get an email notification of Devin's Second Chance's release and other goodies! This was a long time coming! And, I can't fully explain how excited I am to share this news with you! Have you ever felt that way? Ooh, it's lovely! The soft wash of blues are so romantic and breezy. Very cool with the boots and the kisss offset by the book's title. And I love "Morning Lake Novel." Great to know there will be more coming in the series. Congrats, Lorraine. I'm excited for you! I look forward to reading this and also showcasing on my blog. Woot!!! I love it! I'm looking forward to reading this -- I think you had some Six Sentence Sunday snippets of this one. Congrats on the release -- this is so exciting! Aw, thanks, Mae! I'm pretty excited about how this is coming together and excited to share this on your blog too! It was fun choosing the images, but the cover went through so many iterations I thought for a while that nothing would click. Then I found the cowboy boots! LOL. Thanks, Donna! I may have had a few SSS posts on this story... certainly a lot from the next one in the series (Annie's Christmas Dream). very nice cover and enticing blurb! I love that you've got it in a series. This is so exciting, Lorraine. Great cover too. Looking forward to reading it. Congratulations Lorraine, what wonderful news! Will it be available on Amazon or with a publisher?